If you wanted to get good at smoking enemy planes in 1943, it was a lot easier to start off dusting clay pigeons with a Remington shotgun. It’s a simple concept, with a shotgun being easier and cheaper to cut a trainee’s teeth on “wing shooting” than a full-sized machine gun. Accordingly, the Army and Navy bought 59,961 Remington Model 11 semi-auto — the company’s version of the Browning A5 — during World War II., along with 204 million clay targets then got to work. Maine-based Poulin Auctions has one such surviving Remington M11 in their upcoming Spring Premier Firearms Auction. 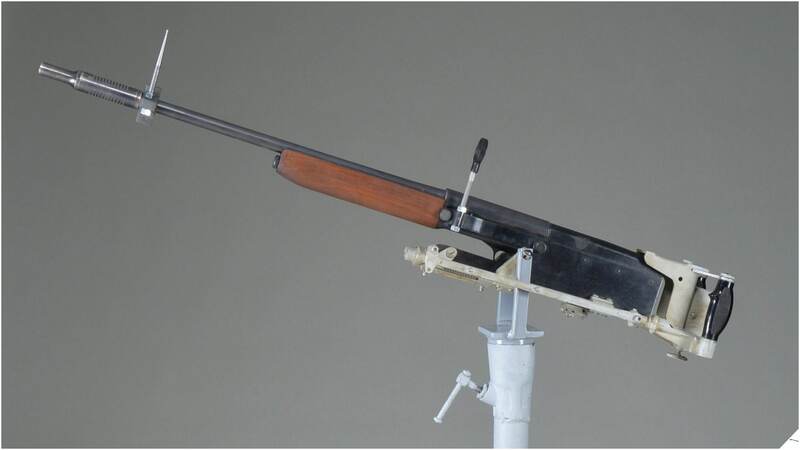 The gun includes “U.S.” acceptance marks and a Bell Aircraft adapter gun mount to allow the 12 gauge to mimic the feel of a spade-gripped Browning machine gun. Even if the Remington 11 isn’t your cup of tea, the auction has lots of other interesting items like a Vietnamese M1911 copy that was surely unlicensed, a Singer that is, and an Italian Carcano Tromboncino, for those who think the regular Carcano didn’t have enough bass. The below Army Air Corps training film from 1943 — which includes a young Lt. Ronald Reagan — shows how aerial gunners, particularly rear gunners, were trained. You get to see Lt. Burgess Meredith start working with Remington Model 31 pump-action shotguns and clays at about the 8:34 mark before moving up to full-sized .30-cal and .50-cal machine guns. You’ve come this far, why not?